The most common site of a stress fracture in the lower body is the tibia or shin bone, followed by the metatarsals, the bones in the foot behind the toes. Most stress fractures develop gradually. 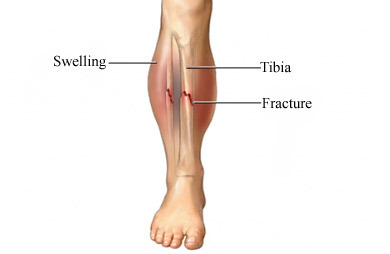 A typical tibial stress fracture will initially be felt as “shin splints,” a catch-all term that refers to pain along the inside of the tibia. The pain usually starts out over a large area along the shin bone, and is mainly noticed after a hard training session or race, or the morning after a long or difficult workout. Shin splints occur when the muscles pull away from their attachment site along the inside of the tibia. At this point it’s possible to prevent a stress fracture by responding to the developing problem: Stop running and see a sports medicine specialist. Left untreated, the muscles will continue to pull, and this may cause a crack to form in the bone. The pain will progress to the point where it is noticed more during the run, and become focused on a smaller area of the bone.